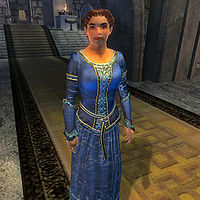 Narina Carvain is an Imperial noble and the Countess of Bruma. She is a Nibenean Heartlander and has a great interest in Akaviri artifacts, her collection of which can be seen in the throne room. She is looking for an experienced adventurer to find an artifact in Lifting the Vale. She wears a blue silk shirt, blue silks and blue suede shoes. She has a sizable amount of gold, a leveled piece of jewelry and keys to the Castle Bruma interior and exterior. The countess wakes up early every day at 6am and wanders near the entrance area of the Lords Manor in Castle Bruma until 8am, when she will descend to her throne in the Great Hall and hold court until 6pm. From 6pm to 8pm she will again retire to the Lords Manor and pace near the entrance, before returning to the Great Hall to enjoy a formal dinner from 8pm until midnight. At midnight she will return to her bedroom in the Lords Manor and sleep for the rest of the night. On Sundas she heads to the Great Chapel of Talos at 6pm sharp, where she worships for four hours before heading back to the Great Hall for a late dinner at 10pm and retiring to bed at midnight. The only exception to this schedule is during the quest Defense of Bruma, when she can be found sitting on her throne night and day awaiting your arrival. Once you arrive, she will leave the castle and seek out Martin at the Great Chapel of Talos to hear his plan, accompanied by Captain Burd. She will subsequently return to the castle and resume her normal schedule. When you meet her for the first time, she will introduce herself: "Lady Narina Carvain, Countess Bruma. Welcome. You'll excuse me if I keep this brief, but affairs of the county await me." When you ask about Bruma, she will express her opinion: "Some see only the conflicts between northern and southern cultures, but I see the way they are stronger when woven together." She is quite pleased with the achievements of High Chancellor Ocato: "He served Emperor Uriel for many years, and so far he has done well in an impossible situation." If you're interested in buying a house in Bruma, Narina is selling one located next to the main gate: "I've been looking for just the right owner for a special home I have. It's a quaint little house conveniently located just off the main gate." If you agree to pay the price of 10,000 gold, she will be most pleased: "Wonderful. I'll have the deed transfered [sic] to you. Here is your key to the door. As I said, it's located right by the main gate. I've had a look at the place myself, and it could use some furnishings inside. Quite barren in there I'm afraid. I'm fairly certain that Suurootan at Novaroma here in Bruma can acquire the things you'll need to make it look like home." If you're not ready to buy, she will be irritated: "I'd prefer to only discuss the property with serious buyers." If you tell her you can't afford it, she will be quite irritated as well: "What a shame. I guess I have to look for another buyer." During the Defense of Bruma, when you confront her with Martin's plan, she will doubt its usefulness: "A desperate plan indeed. This ... Prince? Emperor? Martin would risk my whole city to gain a Great Sigil Stone?" When you tell her that the Amulet of Kings must be recovered, she will realize there is no other way: "This is the only way to stop this invasion from Oblivion? I must confess, you are the first person to speak of victory against these daedra. This war has seemed hopeless to me, but what else was there to do but hold on and wait for a hero to arise to save us? And now it seems there is an heir to the throne after all, hidden at Cloud Ruler Temple... and perhaps a hero as well?" When you tell her to wait for Martin at the chapel, she will express her trust in you: "You avoid answering my question ... Very well. Don't think I doubt you. The rulers of Bruma have long had dealings with Cloud Ruler Temple. We know whom they serve. I will meet Martin at the Chapel. When all is ready, I will order my men to stop closing the Gates and prepare for battle." After she talked to Martin at the chapel, she will wait for you to get ready for the battle. Upon greeting you she will ask you if you're ready, in which the manner will differ according to the number of allies you've gained during Allies for Bruma. When you've collected none, she will say: "I will call out my militia if necessary, but must we truly stand alone? I don't think we can survive the daedric onslaught." When you've collected only one, she will say: "Some help is better than nothing, but my militia are farmers and shopkeepers, not soldiers. I would recommend delaying until more help can arrive." When you've collected guards from at least four cities, she will say: "I appreciate the help that you have brought to Bruma. I begin to think we have a chance. But my militia is no substitute for trained soldiers. Can we not wait for more help to arrive?" When you've gained help from all the seven cities, she will say the following: "You are a diplomat as well as a warrior, it seems! I would prefer more men, of course, but if we must offer battle now, so be it." Other than these, she will say: "I am ready for battle when you are, champion. What say you?" If you tell her you're not ready yet she will keep waiting: "As you wish. I will wait here while you prepare yourself for battle." When there are still cities left who can provide help, you can tell her you will get more help, at which she will reply: "Thank you. I know that delay is dangerous, but it is all for naught if we lose the battle before you can recover the Great Sigil Stone." When you tell her you're ready, she will accept: "So be it. Bruma's fate is in the hands of the gods now ... and yours. ", after which the conversation ends, and she will exclaim: "Burd! Deploy the troops for battle!" The nobility admire her: "I believe the rugged climate of Bruma suits Narina Carvain. She's tough and cold, but you always know what to expect from her." or "Millona Umbranox, Arriana Valga, and Narina Carvain seem to rule their counties perfectly well without male assistance." Though they seem to think she's moody: "No wonder Narina Carvain is so cranky. If you had to live year-round in a cold, drafty, soot-stained castle like Bruma, you'd be cranky, too." After being confronted by Tolgan during Lifting the Vale, she will express satisfaction by your deeds: "I've heard much about your deeds from my people in Bruma. I trust that the stipend Tolgan gave you whetted your appetite?" When you tell her that's why you came, she will tell you about her hobby: "Good point. Allow me to formally introduce myself. I'm Countess Narina Carvain. I assume you've noticed all of the Akaviri relics I'm displaying. Well, it's safe to say I'm a collector of sorts. I've invested a great deal of time and money acquiring these bits of ancient history. In fact, I'd be so bold as to proclaim my collection the most complete in all Cyrodiil; perhaps even beyond. Except for one thing. A particular relic has eluded me for many years. Possessing this piece of Akaviri antiquity would make my collection complete. I'm of course referring to The Draconian Madstone." She will reveal more information on the stone when you ask her about it: "The stone is a fine bit of Akaviri craftsmanship. Worn like an amulet, this talisman is said to protect the wearer from poisons of any type. The Madstone appears as a snake coiled around and encircling itself. The eyes of the snake are supposed to be precious gems or some such. Through my sources, I've learned that the last reported location of the Madstone was the ruins at Pale Pass." If you ask her about Pale Pass, she will ask you: "Are you familiar with the history of Pale Pass?" Confirming this will make her cut to the chase: "Well then, history lesson notwithstanding, I hope you can recover the Draconian Madstone. ", after which you can ask her about the mission. You could also say you don't care, which will offend her: "Look, there's no need to be rude. I just thought it might have been interesting to you." If you however tell her you don't know about the history of Pale Pass, she will provide you a detailed background: "Back at the end of the First Era, raiders from the continent of Akavir attempted to gain a foothold here in Tamriel. At that time, the Empire was broken into smaller factions. Reman Cyrodiil decided to unify them and form an army to repel the Akaviri raiders. The force became known as the Army of Reman. The two armies clashed in what's now northern Cyrodiil. The Akaviri were strong and well supplied. But their greatest error was marching through Morrowind on the way to their objective and dismissing the response it would garner from Vivec. They didn't count on Lord Vivec forming an alliance with the Trident-Kings of the Dreugh. From Morrowind, he struck at their rear flank. Not only did this make the Akaviri fight on two fronts, it also cut off access to reinforcements and supplies from the sea." At this point in the conversation, you can ask her if the alliance ended the conflict, to which she will reply: "Not quite. The Army of Reman knew that the organized Akaviri forces were commanded from a hidden post in the mountains. Rumors placed it in a snowy vale called Pale Pass. That's where Reman focused his attention. As his forces fought their way across the Jerall Mountains, the Akaviri suddenly surrendered. It was assumed they were overwhelmed and gave up. The only strange part was that the command post and Pale Pass were never found. It was dismissed as rumor and the Army of Reman celebrated. It's come to my attention that the post did exist and it happens to be the last reported location of the Draconian Madstone." If you ask her who Reman Cyrodiil was, she will be quite surprised: "You must be joking, right? Who hasn't heard of the greatest known hero of the First Age? Reman Cyrodiil not only was the conqueror of the Akaviri forces, but he actually convinced them to help build the Empire as it is today. With such an Empire at his disposal, he conquered most of Tamriel, except Morrowind of course, and was crowned Emperor. In fact, he instituted the rites of becoming an Emperor, which included the construction of the Amulet of Kings. His alliance with Lord Vivec during the Akaviri invasion is just one example of his cunning and ingenuity." If you however tell her history lessons are boring, she will be irritated by your lack of interest: "I beg to differ, history can be quite enriching. Hmph. I figured you to have more brains than brawn, but so be it." When you ask her about the mission, she will explain: "If you retreive [sic] the Draconian Madstone for me, I'll be happy to compensate you by rewarding you with another Akaviri artifact. Are you game?" When you accept, she will be pleased: "I had a feeling you'd accept. Good. Then let me tell you how you're going to find the Madstone. I've come into the possession of a diary written by an Akaviri messenger. I suspect that the text within can lead you to the ruins. Here's a translation of the passages we could still read. It was quite damaged. I've also included a rough map that was drawn in the diary as well. I'm also providing you with a unique key that was supposedly found with the diary. I'm assuming it will prove useful when you arrive at the site." Declining her offer will surprise her: "I'm not used to hearing no, but I admire your boldness. I won't force you to go, only to request that you reconsider in the future. I'm sure the lure of my reward will have you back sooner than you think." When you ask her about the diary, she will provide more background: "I paid several scouts to try and find the ruins at Pale Pass before I hired you. They were only able to locate the first of a series of landmarks. These landmarks are mentioned within the diary. The one referred to as Dragonclaw Rock has been located. I'll mark it on your map. The rest is up to you. My scouts reported bitter cold and dangerous creatures in the area, so they couldn't proceed. Be cautious, and return home soon. Good luck." Asking about the diary again, she will say the following: "The messenger's diary will make a nice companion to the Madstone in my collection." When you've at least found your way through the Serpent's Trail, she will comment on your discovery when you ask her about Pale Pass again: "With the information you have given me about Pale Pass, it could take scholars many years to amend the history books." When you return with the Madstone and telling her you've recovered it, she will be astounded: "I never thought it possible. I mean... I had hoped... but to actually hold it in my hands. It's more beautiful than I imagined it. Congratulations. I had a feeling you were the right person for the job. And it seems I owe you a reward. This Akaviri ring was found with the messenger's diary. It awards the wearer with increased agility and resistance to harmful magic. It's known as the Ring of the Vipereye. I hope it serves you well in your future journeys." She will thank you again should you ask her about the Madstone: "The Madstone is finally mine. It's the pinnacle of my collection. Many thanks to you again." This page was last modified on 11 November 2018, at 19:55.